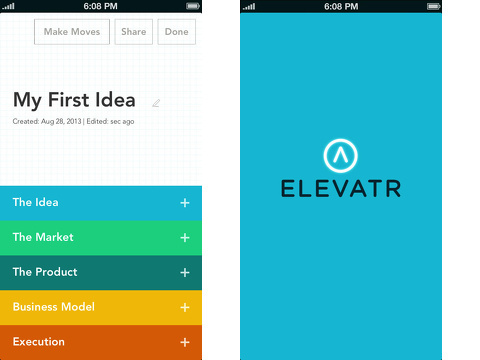 Take your elevator pitch to the next level with the Elevatr iPhone, iPod Touch, and iPad app. Research, finesse, and move forward with your professional services and products with its smart tools. The graphics remind you of file folders arranged on your desk, but the user-friendly, simple interface create an inspiration point to attend to details without the frustration of shuffling papers. The $9.99 download from the iTunes App Store is a worthy investment for entrepreneurs. The angle of the Elevatr iPhone app is just like an elevator speech. You must craft concise, cogent talking points for not only the brilliant product or service you envision, but you must also be able to articulate complex aspects of your business plan efficiently as well. In Twitter-style, the Elevatr iPhone app gives you a set number of characters to create a smart, yet compelling picture of your business model. You are guided through the first two steps, then a new, combined screen gives you the chance to fine-tune your plan. You type your idea within a limit of 140 characters. Next, you have 20 characters for an idea’s name. The idea’s home screen includes the name at the top with five fields below it – idea, market, product, business model, and execution. Each category expands with a tap on the plus icon to dig deeper into each area. For each category of information, there are complementary prompts to examine your service or products. You create a list of bullet points for your target market, competition, and competitive advantage. You can also add photos as bullet points. You may add items to your bullet points for a range of topics including monetization, distribution, financials, key people, milestones, and next steps. 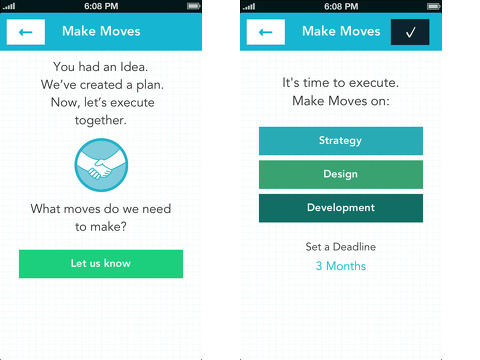 The interface for adding details and brainstorms is intuitive and agile. It is shockingly simple to develop nuanced, thoughtful notes with the Elevatr iPhone app. When you are ready to receive feedback or request help from an employee or colleague, there are simple sharing features. You touch share in the upper right hand corner of the screen. You may add a layer of security with password protection, and a PDF or DOC link is generated of the idea. You can choose to un-share your idea at any point. You can also seek the advice of Elevatr’s business consultants. The Elevatr iPhone, iPod Touch, and iPad app brings order and precision to your vision with its clean, intuitive interface and thought-provoking tools. AppSafari review of Elevatr was written by Jenni Ward on February 3rd, 2014 and categorized under App Store, Enterprise, iPad apps, Notes, Productivity, Reference, Universal, Utilities. Page viewed 4740 times, 1 so far today. Need help on using these apps? Please read the Help Page.